Michelle Paver’s series of books set in Mesolithic Scandinavia, The Chronicles of Ancient Darkness, published by Orion Children’s Books are a fantastic read. The world is full of demons and spirits and one boy, Torak, is the hero who can save the world. He is left alone in the world when a crazed bear kills his father and the only friend he has is a wolf cub who quickly grows up to be a very useful companion. The first in the series is Wolf Brother and, as it was set in Scotland, Forestry Commission (Scotland) created a set of resources, Wolf Brother’s Wildwoods (pdf), for teachers to build activities around the book. 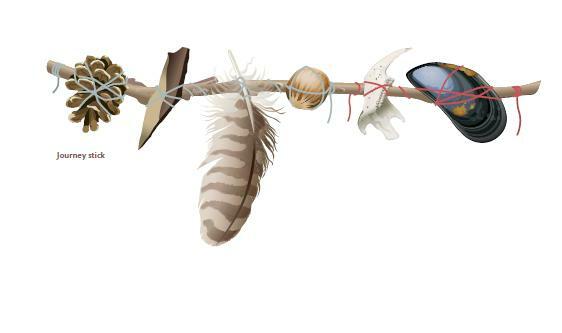 These activities are mainly to encourage outdoor learning, particularly in the Forest School approach, but they are also very helpful in exploring what life was like in Stone Age Britain. The Mesolithic (middle stone age) in Britain is a time between the melting of the ice sheets around 10,000 BC to the introduction of farming around 4000 BC. The ice sheets had left Scotland by about 8500 BC and that’s when people started to explore and exploit the area. Wolf Brother must be set at least a few hundred years if not a couple of thousand years later as the landscape is pretty well known and there are different groups of people living in different environments, e.g. in the forest, on the coast, on the islands. Torak, as an outsider, gives the reader a chance to get to know the Mesolithic. We meet people who live in skin tents, who use flint arrows to kill red deer and then use every part of the deer for food. 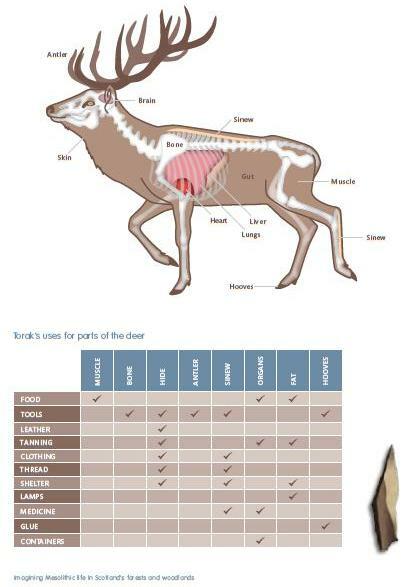 The Forestry Commission resource has a great poster detailing what every part of the deer could be used for. This could bring up discussions of sustainability, reducing waste, contrasts with modern day hunting in the UK, and many other issues. The book is exciting all the way through: Torak’s capture by the Raven clan; his escape aided by one of the Raven girls, Renn; their quest across a glacier; a devastating avalanche just at the right moment. Paver does not talk down to her readers, exploring topics such as self-sacrifice, loyalty, and loss. Nor does she avoid using challenging language, but the excitement and paciness of the book keep readers enthralled. It is probably most appropriate for Years 5 or 6. There are several sequels, too, so it should encourage readers to go on and read more. The resources created for teachers to use alongside the book, Wolf Brother’s Wildwoods, provides ideas of activities to do in the classroom and outside in woodland. These include making timelines, making nettle cord, meeting trees blindfolded, building shelters, microhikes wriggling along a rope ‘track’ on your tummy, laying and following tracks, creating journey sticks, writing kennings (knowings) and making tree spirits – all prefaced by extracts from the book. There are lots of images of recreated Mesolithic scenes as well as the animals, plants and tools mentioned in the books. Wolf Brother’s Wildwoods also gives teachers south of the border a glimpse into Scotland’s curriculum for excellence. It’s always interesting to find out how others approach pedagogy, and contrast it with one’s own approach. A book for adults set in the same time period and general area is The Gathering Night by Margaret Elphinstone. It is a very insightful view into the Mesolithic world, beautifully written and full of the same kind of themes as Wolf Brother. This entry was posted in Activity, Book review, Teaching resources and tagged mesolithic by Kim Biddulph. Bookmark the permalink.